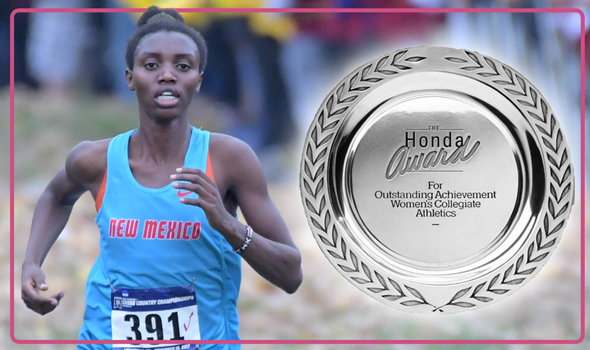 Ednah Kurgat, a sophomore from the University of New Mexico, was named the Honda Sport Award winner for Cross Country as announced by Chris Voelz, Executive Director of THE Collegiate Women Sports Awards (CWSA) today. The Honda Sport Award has been presented annually by the CWSA for the past 42 years to the top women athletes in 12 NCAA- sanctioned sports and signifies "the best of the best in collegiate athletics." With this honor, Kurgat becomes a finalist for the Collegiate Woman Athlete of the Year and the prestigious 2018 Honda Cup which will be presented on a live telecast on CBS Sports Network on June 27, 2018, in downtown Los Angeles. Kurgat was chosen by a vote of administrators from over 1,000 NCAA member schools. Finalists included Amy-Eloise Neale (Washington), Allie Ostrander (Boise State) and Charlotte Taylor (San Francisco). Hailing from Eldoret, Kenya, Kurgat captured the 2017 NCAA Individual Cross Country Championship title setting a new Division I 6k women’s championship record by more than eight seconds. She captured five wins in all five meets she competed in to finish the season undefeated and led the Lobos to its second National Championship title in three years. She is the first woman to win the NCAA team and individual title in the same year since 2010. She was named the U.S. Track & Field and Cross Country Coaches Association (USTFCCCA) National Women’s Athlete of the Year and was the Division I Mountain Region Women’s Athlete of the Year. A USTFCCCA First-Team All-American, she earned USTFCCA national Cross Country Athlete of the Week honors twice on the season. She was also named the 2017 Mountain West Cross Country Female Athlete of the Year after capturing the Mountain West Cross Country Championship title. "It’s a great honor to be only the second woman in UNM history to receive this award in any sport," New Mexico head coach Joe Franklin said. "It’s a testament to Ednah’s ability as a student-athlete."